Since the beginning of the season, I’ve said, don’t underestimate the Amity Boys Ice Hockey Team. I knew going into Wednesday night’s game that they were in for a battle with Notre Dame-West Haven, but they were good enough to come through with their perfect season intact. Prior to the game I sent head coach Mike Richetelli a note stating, Notre Dame is NOT going to want to lose to Amity. They are going to play dirty and will spend a lot of time in the penalty box. Our boys would just have to get it done no matter how much ND pushed their buttons. Of course “Scooter” already knew this, great coaches have great instincts, and the boys were ready too. Well, the first period was very fast and very physical, during which Notre Dame racked up 3 penalties to Amity’s 1. And the first period was scoreless. There was no way that Notre Dame was going to lose this matchup. The second period went on and on, still scoreless, then, with 15 seconds remaining ND’s Charlie Andriole scored the first goal, assisted by Ian Hayden. Amity and ND had 2 penalties each in the second period. When the third period rolled around, it was do-or-die for both teams and they would do whatever was necessary to win. (ND 4 penalties, Amity 2). 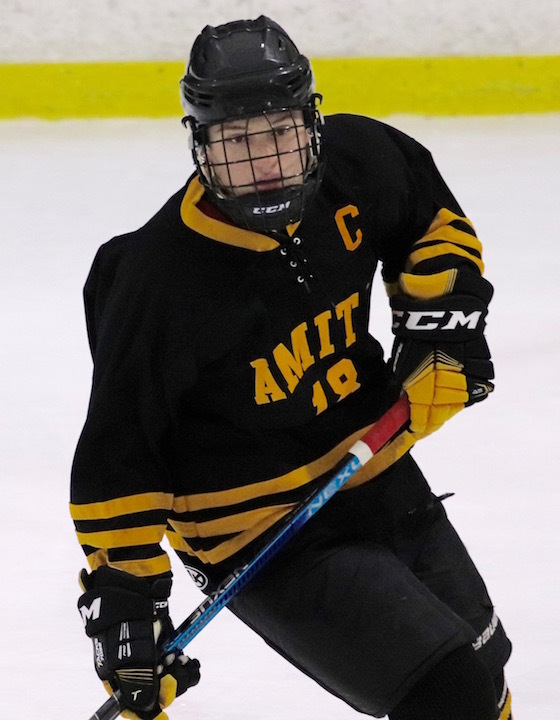 Amity was ready to show what they were made of and it only took 38 seconds for captain Jay Csejka to make an unassisted goal and tie the game. The teams battled it out, and both goalies, Amity’s Malachi Zurolo and Notre Dame’s Connor Smith worked extremely hard. Finally, with just 3:45 remaining in the game, Nelson Bordeleau broke the tie with the winning goal, assisted by Justin Miller. The Spartans were able to hold Notre Dame off until the final buzzer, and there it was, Amity Won 2-1, still undefeated with 7 consecutive victories under their belts. Zurolo was named player of the game after making 38 stops. Next Up: Amity is on the road at the Northford Ice Pavilion for a game against Branford (4-2-1) on Saturday, Jan. 12 at 3:15 p.m.
A million thanks to Kristina Kaoud for the victory photos. Jordan Conn (#2) scores for Amity with just 2 seconds left in the second period. The Amity Spartans Hockey Team was on the road in Stamford on Thursday night for a game against the Trinity Catholic Crusaders. In the first 11 seconds of the game, Joey Schittina put the Spartans on the scoreboard, assisted by Alex Leyner. Then Trinity’s Jake Levato had back-to-back goals, the first at 13:28 assisted by Andrew Ellis and Matt Dimartino, followed by another less than a minute later, assisted by Jack Kinahan and Logan Healy. Amity’s Jamie Blum tied things up at 10:45, assisted by Colin Hughes and Brian Early. But Trinity would have none of that, 30 seconds later, Kinahan scored, assisted by Will Tellini. At 7:42, Levato got his hat trick, assisted by Jay Bacco and Kinahan. With just 3:56 remaining in the period, Amity’s Ken Page got one in assisted by Blum and Schittina. End of period score 4-3 Trinity. No one scored for the first 12:29 of the second period, until Blum shot one past Trinity Goalie Lance Lippmann at 2:31 on an assist from Nelson Bordeleau. Then, with just 2 seconds remaining, Jordan Conn scored on an assist from Michael Miller. End of period score 5-4 Amity. Trinity wasted no time in tying the game. Within 48 seconds of returning to the ice, Kinahan got one in past Amity goaltender Michael Holloway, assisted by Levato. But the Spartans had their own secret weapon, Jordan Conn who scored at 10:50, assisted by Hughes. Amazingly, just 7 seconds later Conn got his hat trick on an assist from Early. The Crusaders’ Kinahan made one last goal – yes, a hat trick – assisted by Healy with 2:38 remaining in the game, but Trinity could not outscore the Spartans. Amity won this very close game 7-6. And if you didn’t catch it, all of the Crusaders’ goals were made by two players, Levato and Kinahan. Up Next: The Spartans take on Watertown at the Bennett Rink in West Haven at 3 p.m., Saturday, Feb. 24. 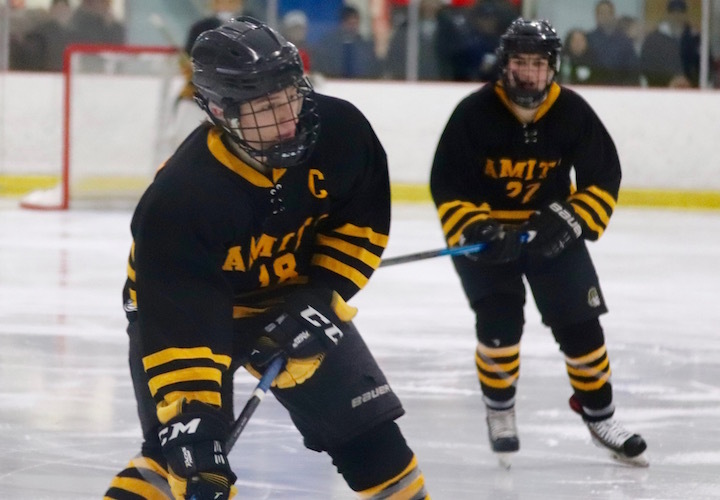 The final game of the regular season will take place at Wonderland of Ice on Monday, Feb. 26 at 8 p.m. when Amity goes up against Fairfield Warde/Ludlowe. Whatever happens here-on-in I’d like to congratulate Amity and head coach Mike Richetelli on a magnificent season. Just keep doing what you do best boys, and knock them out in the Tournaments. Thank you to Steve Conn for sharing his photos from all the Away games. 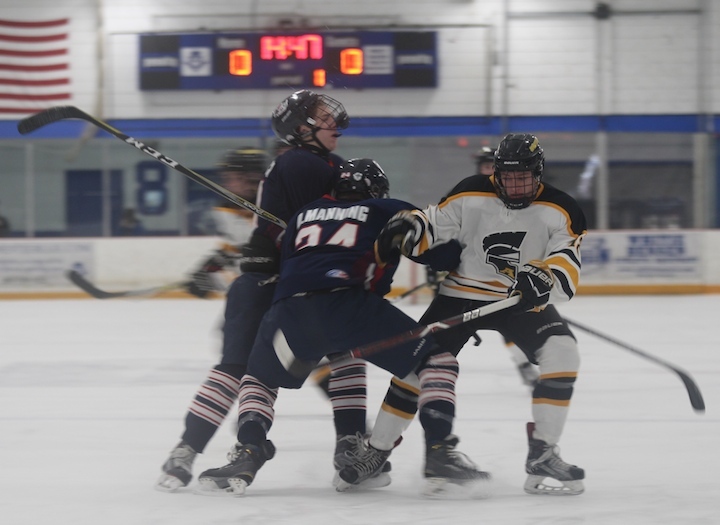 The Amity Spartans Boys Ice Hockey Team hosted the New Fairfield/Immaculate Mustangs for a non-conference game in West Haven on Saturday, Jan. 20. Amity got off to a good start with a goal by Jason Csejka, assisted by Jamie Blum at 8:38 in the first period, and Spartans goalie Michael Halloway preventing NFI from getting anything past him. First Period score 1-0 Amity. Next Up: Amity is on the road in Hamden on Sunday, Jan. 21. 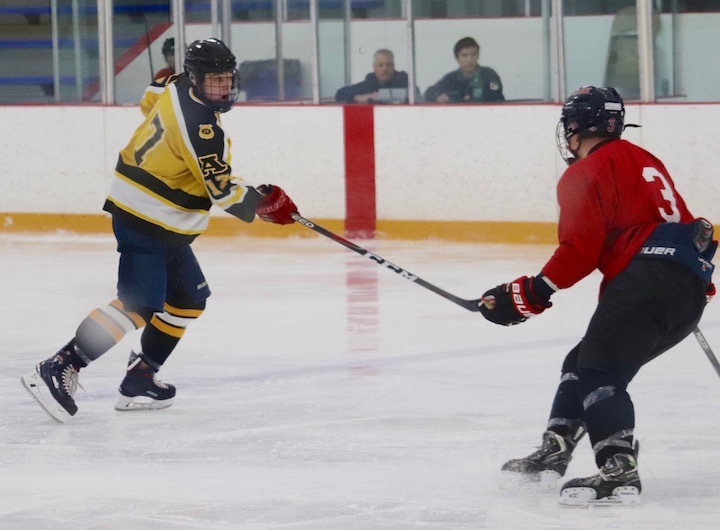 Before the regular season begins, teams play scrimmage games so the coaches can evaluate how the players perform and to give the boys and girls an opportunity to get out there and hone their skills against actual opponents. 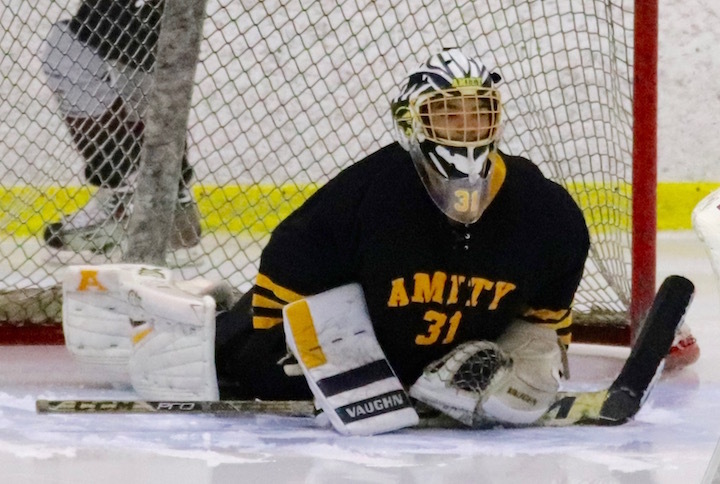 The Amity Varsity Hockey team won it’s first scrimmage against Newtown 4-2 on Wednesday then on Friday, they went up against the division 1 Hamden Green Dragons. Prior to the game, head coach Gary Lindren said this year’s team showed promise. Of course in the pre-season they are still finding their way, but he believes the 2015-16 Spartans will get into the playoffs. Lindgren said Hamden is an excellent team and that Amity would have to work hard against them. As an observer, I noticed that the players had some mad skills. They are faster on the ice than last year and work well together as a team. Even though they lost this match-up 6-0, the Spartans held their own against the Green Dragons for the majority of the game. It took 9 minutes of play time before Hamden got onto the scoreboard, and that says a lot for Amity. I think the coach is right, this team can go far this season. They hit the ice again today (Saturday, Dec. 12) at the Edward L. Bennett Rink – West Haven at 3:45 p.m. Come and witness for yourself what the buzz is all about. After Friday’s game, Asst. Coach Mike Richetelli said this was the team’s third day on the ice and they were still getting their “feet wet.” He said Hamden is a solid division 1 team and it was good for Amity to play them and see what they could do. “We still have a lot to do, and we’ll see how far we can go,” he said. Opinion: Will The Amity Spartans Hockey Team Make Us Proud This Year? Amity High School, Around Town, Home, School News, Sports Comments Off on Opinion: Will The Amity Spartans Hockey Team Make Us Proud This Year? 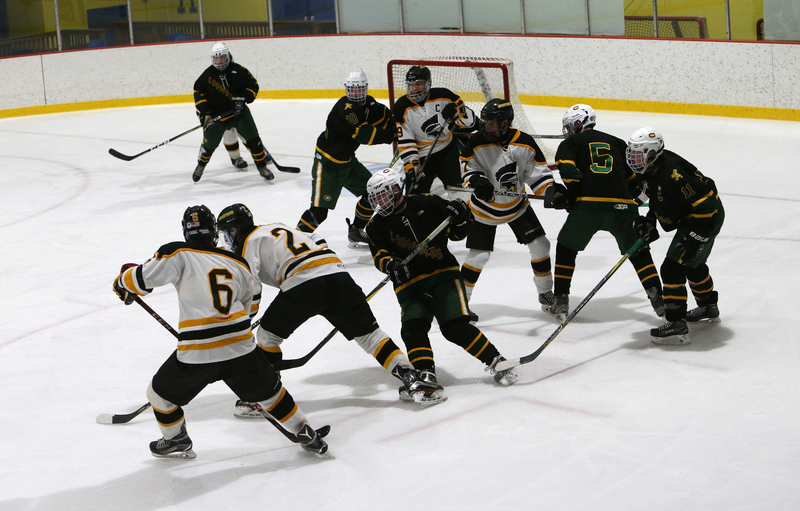 The 2014-15 Amity Spartans Varsity Hockey Team had some big skates to fill following last year’s phenomenal season. Sadly, with the graduation of the 2013-14 senior “stars” Goalie Brian Mosher, Adam Shea, Brett McNeil, John Uscilla and Keating Seymour, this is a rebuilding year, with a primarily young team and just five seniors. Among those seniors are Dalton Luciani, Kevin Ryan and Zachary Shelnitz, whose names we often heard at last year’s games. They have the experience and are good team players, but can they carry the 2015 Spartans on to greatness? Friday night’s scrimmage games at the Hockey Jamboree in West Haven proved underwhelming. Last year Brian Mosher was so amazing that any goaltender who follows will have to work ten times as hard to even come close — although of the three who geared up in the $400 goalie padding, Freshman Tyler Cole #30 (Mosher’s old number) shows a lot of promise. The boys showed spirit and drive and had some good passes but they will have to step things up a bit if they want to get anywhere this year. Cheshire’s team was tight and blanked Amity 5-0, then Immaculate came out and defeated the Spartans 3-1. I have faith in Coach Gary Lindgren and Asst. Coach Mike Richetelli and their abilities to pull this team together. Let’s just hope the boys can follow their directions. Coach of the Year Michelle Martinik shares a “WOW” moment with her Lady Spartans. When any coach begins the season he or she works hard to get to know their players and encourage everyone to do their best on the ice, court, track or pool and to show good sportsmanship at all times. The Southern Connecticut Conference (SCC) of which Amity is associated, has named three of the Amity High School coaches as “Coach of the Year” for his or her particular sport. • Michelle Martinik has been named the SCC Girls Basketball Coach of the Year for her exemplary work with our amazing Lady Spartans, who are moving on to compete for the state title. • Jeremy Iverson was recognized as the SCC Boys Indoor Track Coach of the Year. • Amity Interim Boys Ice Hockey Coach Mike Richetelli has been named the SCC Hockey Coach of the Year. The Spartans show incredible teamwork every time they step onto the ice, and are competing against Branford High School in the SCC Championship game this Saturday at 2:00 pm at Bennett Rink in West Haven. Coach of the Year Mike Richetelli and the Amazing Amity Spartans. Although we’ve seen Coach Gary Lindgen at every regular game this season, he fell ill before the season began and for personal reasons, needed Richetelli to step in during his recovery. We wish Gary all the best and hope he will be able to return in his full capacity next year. Congratulations to Michelle, Jeremy and Mike, we couldn’t think of anyone better to earn this honor. You all deserve the title! Jim O’Connor, Mike Richetelli and Chad Lombardi, co-founders of Independents for Orange. Years in the making, a grass roots group- Independents For Orange (IFO) has been formed. The organization became official May 30th when paperwork was filed with the CT Secretary of State’s office which reserved the designation. The filing with the Secretary of State will enable candidates to run for municipal offices this November as Independents For Orange. IFO is a group of dedicated Orange community leaders that have come together to provide an opportunity for Orange residents who want to serve in town government and help make Orange a better place without having to be affiliated with either of the two majority parties- Republican or Democrat. 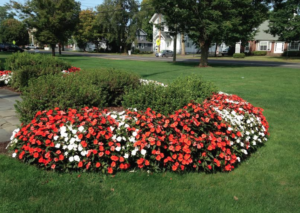 Although a search for candidates has not officially begun, there are no plans at this time to run a candidate for First Selectman. “Out of the gate, we intend to field a slate of under-ticket candidates for 2013 and have it grow from there. We believe this is the first time there will be an Independent under-ticket slate of candidates without running someone for First Selectman in the history of the town. This shows that we’re making a long term commitment to build this for the future from the ground up” said Chad Lombardi, one of the co-founders of IFO. Mike Richetelli will be running for the Board of Selectmen and elementary school Principal Jim O’Connor will be running for Board of Education. “With two children currently in the Orange elementary school system, I have a vested interest in working to ensure that we have the best schools possible in Orange. I plan to utilize my expertise as a longtime school administrator to solidify and advance the goals of our district,” said O’Connor. Richetelli addressed the plans for IFO moving forward. “We’re in the process of building a team of concerned residents that want to work collectively, without party politics. We look forward to talking to people in the coming weeks that want to be part of something new and exciting. So far, the feedback we’ve received has been outstanding. Anyone interested in more information on Independents For Orange may visit www.ifoct.org or email info@ifoct.org.